You can run but you can't swim fast enough to evade this awesome predator of the deep. Fortunately, his skin is soft velour and his teeth are vinyl, so even if he catches you, you'll feel no pain from this cuddly (but fierce!) 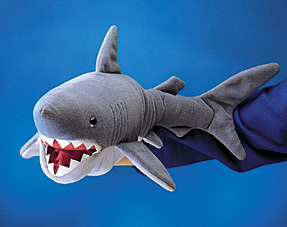 Shark puppet. Measures 22" long.